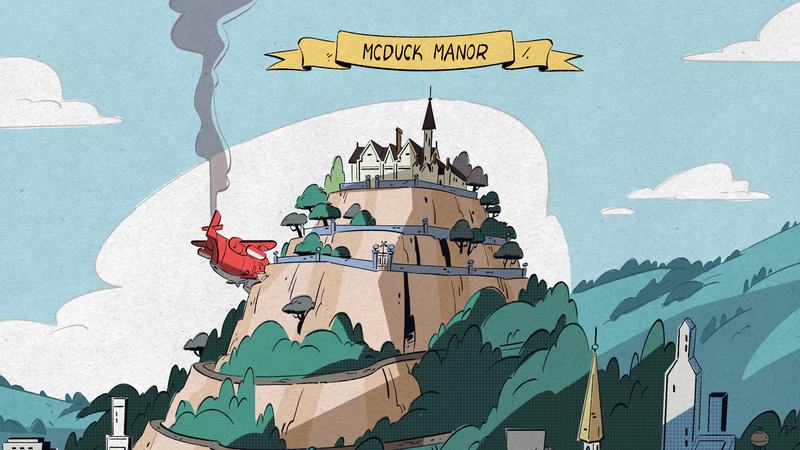 You are going to want to blow up this map of Duckburg, I promise you. There are a lot of fun things hidden here, not just Launchpad McQuack’s plane crashed into the mountain that Scrooge’s McDuck Manor is on. Click to enlarge this image, and you will see a god lounging in the right-hand corner, the obvious town motto in the center, and Flintheart Glomgold—a classic antagonist of Scrooge McDuck’s who wants the title of World’s Richest Duck for his own—in the grips of an octopus on the center left. That’s a reference to something that will happen in the second episode of DuckTales’ return. You’ll also see the special entrance Scrooge has to his precious money bin, a weirdly dark place called Hookbill Harbor which is a “spooky seaside area,” and a new neighborhood called Silverbeak which is, as LA residents have already guessed, based on hipster paradise Silver Lake. Silverbeak is more important than it first appears: it’s also the headquarters of the new character Mark Beaks. He’s a tech billionaire that fans have already taken to calling “Mark Duckerberg.” We also know that the only thing Glomgold—whose headquarters are more traditionally located in the Financial District—and Scrooge agree on is how much they hate Beaks. We can also tell you where a few other characters live. Ma Beagle and the Beagle Boys live in the Industrial District, while Donald Duck’s houseboat is located in those docks you can see in the Financial District. The revamped Gizmoduck, Fenton Crackshell-Cabrera, lives in the suburbs. And across the bay, unseen, is where St. Carnard can be found. A lot of work has been put into this new DuckTales and while it is all delightful, we’re a bit stuck on the hipster duck neighborhood. We’re sure it’s just filled with duck dive bars, places where people throw avocado toast for the ducks to eat, and pond-to-table restaurants. DuckTales premieres tomorrow, August 12.